Until someone invents the fusion-powered backpack, there's no such thing as too much external power. 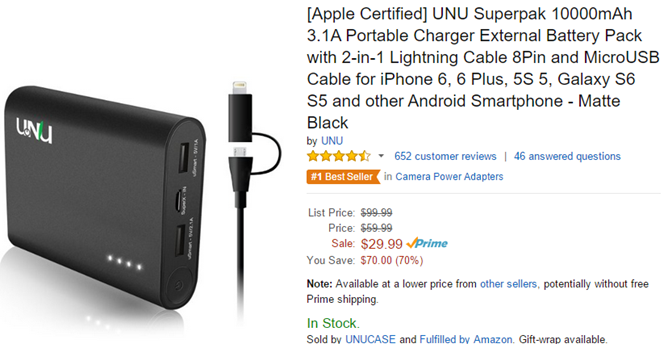 And if you need some of that power on the cheap, there's a great deal on Amazon right now. You can get an UNU Superpak (with a capacity of 10,000mAh) for just $14.99 if you apply the coupon O66REVW3 when you check out. That's a solid $10-20 off of the going rate for these things, and $15 off of the retail price for the same unit. 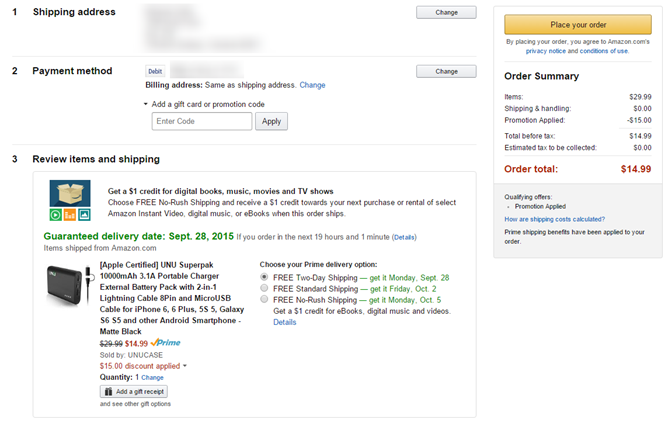 You can also grab free shipping if you've subscribed to Amazon Prime, which recently had its own significant discount. This particular battery pack is pretty small for its capacity, and outputs at up to 2.1A out of twin USB ports. It comes with a standard MicroUSB cable and a Lightning cable adapter, handy if you're one of those consumers who double-dips in the mobile OS cup with an Android phone and an iPad. 10,000mAh should be enough to completely recharge a larger phone 2-3 times, and a tablet once. It has the usual LED indicator for its charge level. Keep in mind that only the black version of the battery is on discount, so putting the white one in your cart will invalidate the coupon (which, again, is O66REVW3). As far as we know, the discount is only applicable on the Amazon's US storefront.